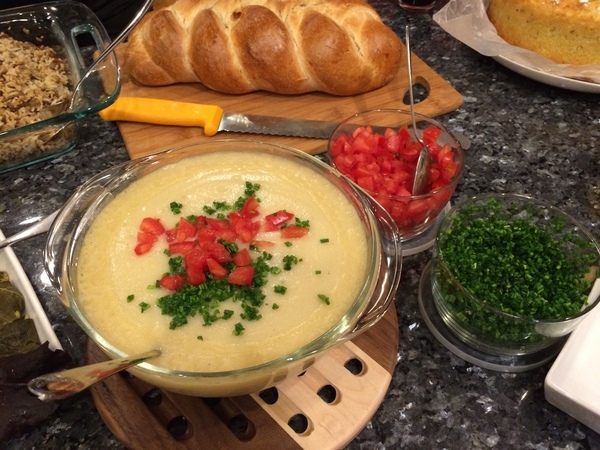 I made North African Cauliflower Soup for a Spiced-up potluck last week. The theme was fennel, a spice which I only recently started using, and I have mainly used the seeds, not ground. The first time I experimented with ground fennel was for a rice dish upon which I improvised a few years ago on one of my Austin visits with my brother. It was one of many herbs and spices I used, and I think it was one (if not a few) too many. The end result was a muddy mishmash of oddly conflicting flavors. I love the flavor of the whole seeds, toasted in oil before adding zucchini, greens, or other vegetables. And they are now a must for me when I make pot roast, and of course they are a large part of what makes Italian sausage Italian sausage. But ground? Not so much. The next opportunity I had to use it was in a dish I made for our fenugreek potluck (yes, fenugreek). I did like the way it combined with the other spices in that dish, so I realized that it is a matter of matching it with the right ingredients, and not having too many conflicting flavors with which it must contend. The spice combination for this soup is cumin and fennel, which I thought surely ought to go together fairly well. They did. The cumin adds its wonderfully earthy tones and the fennel gives it a slightly sweet, floral finish that comes through at the end. And it was ridiculously easy to make. The original recipe called for water and bouillon cubes, but I don't use bouillon these days. I happened to have a quart-sized bag full of vegetable trimmings in the freezer so I threw them into a pan with enough water to cover and cooked it for about an hour and just like that I had vegetable broth. If that is too much work for you, though, store-bought would work just as well. This was delicious heated up for the potluck, but for the rest of the week I just let what I took into work for lunch come to room temperature outside of the refrigerator. Like vichysoisse, it was just as good cool as it was warm. The person who originally posted the recipe mentioned that the tomato and chives (or scallions) garnish really makes the dish. I would have to agree with that assessment. Next time, I might even toast some fennel seeds as well. Saute the onions in a 6-quart saucepan over medium heat until they are translucent, 5 to 10 minutes. Stir in the cumin and fennel and cook for a minute, stirring constantly. Add the potatoes and cook, again stirring constantly, until the potatoes are well coated with the spices. Add the vegetable broth and bring to a boil. Add the cauliflower and bring back to a boil, then lower the heat and simmer, covered, until the vegetables are tender, 10 to 15 minutes. Remove from the heat and puree the mixture in a blender, food processor, or with a stick blender until smooth. Return to the heat and add the lemon juice and salt and pepper to taste. Reheat if necessary over low heat. Serve garnished with the chopped tomatoes and chives or scallions.